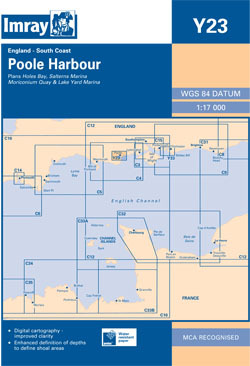 The whole of Poole harbour including the approaches and entrance. Scale: 1 : 16,780. Larger scale plans of Poole and Cobb's Quay Marina, Saltern's Marina complex, and Moriconium Quay. For this new edition the chart has been fully updated throughout using the latest available depth surveys. First published: 01-07-2014, current edition printed: August-2016.